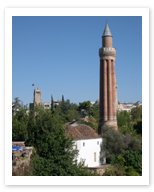 “Yivli Minare” in Turkish, this red and turquoise minaret stands directly in front of Kaleici. Part of a Seldjuk complex originally built in the 13th century, the minaret itself is the only part of the ancient complex that still stands, the mosque itself having been rebuilt. It has become the symbol of the beautiful city of Antalya.